As you can probably guess, this is a bit of a departure for me. I mean, I do like comic books, but as of yet I haven't ever managed to collect a series long enough for me to review anything like this. So when my sister decided to lend me her copy of the collected issues of the Green Lantern mini-series Blackest Night, I figured that this would be a good opportunity to try out my reviewing skills on comics. Plus, I think part of me just wants to be like Linkara. Blackest Night is probably not the best place for me to have started reading within the DC Universe. Don't get me wrong, my knowledge of comic book lore is surprisingly up to date for someone with little opportunity to read them, mostly down to the aforementioned Linkara, but I can see this being quite confusing for complete newbies. 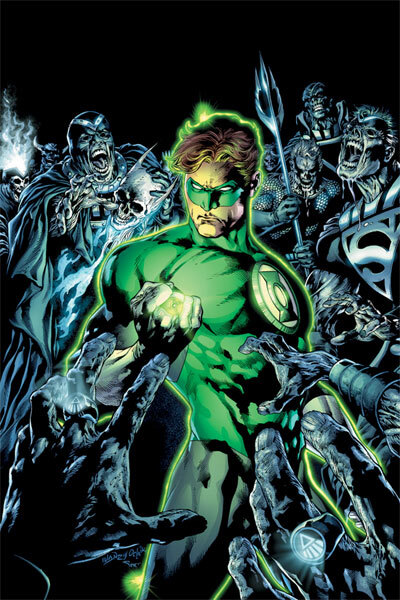 The plot focuses on Hal Jordan, one of the more famous of the Green Lanterns to inhabit Earth (the one that the movie was centred on, if anyone was wondering), as he teams up with various allies and enemies to fight against the threat of the Black Lanterns. For those of you wondering, the basis of the Green Lantern powers is that there are powers based on a range of emotions, each of which can be equated with a colour from the colour spectrum: for example, green is will-power, yellow is fear, red is rage, etc etc; it sounds silly, but the colour spectrum does become important later in the plot. The black lanterns represent and control death, a power that is greater than any one colour on this power spectrum, necessitating the allegiance of all the different coloured Lantern Corps in order to save the universe from dying. If that explanation seems convoluted, then that's because of the huge amounts of continuity that there is in this comic; my explanation only covered the absolute basics. 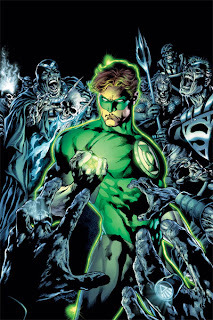 Other continuity bits include the deaths of various superheroes and supporting characters which are more important in past mini-series (such as the significance of Sue Dibny and Jean Loring in Identity Crisis), the resurrections of characters like Barry Allen/The Flash (Final Crisis/The Flash: Rebirth) and Hal Jordan himself (Emerald Twilight/Zero Hour/Green Lantern: Rebirth), as well as many other minor things. Regardless of the huge amount of continuity that proceeds this, Blackest Night does a reasonable job of bringing the reader up to speed with the main plot threads, although this does occasionally lead to some moments which are obvious exposition dumps, mainly in Hal Jordan's narrative. Okay, so I've complained a heck of a lot about the sheer amount of past knowledge that is necessary, or at least advisable, to know in order to appreciate this comic, but I haven't really touched on whether the plot itself is any good. It's certainly made me more interested in reading more about the Green Lantern Corps. In terms of DC superheroes, I was always more interested in reading mini-series about Batman and the Teen Titans, as they were the stars of the cartoons that I grew up with as a kid; in terms of the other main heroes of the universe, particularly Superman and Wonder Woman, they just seemed a bit too perfect for me to get too interested in them. This comic combated that by giving the Green Lantern more depth and complexity than I had first given him credit for. The comic did two other things that I can recommend it for. First, it talked about something that always bothered me about superheroes: the number of times that some of them have died and come back to life; with the Black Lanterns bringing back dead heroes and villains as the undead, resurrections are brought to the fore and the consequences are more fully explored and exploited. The second thing that the comic did that I particularly liked was the focus on some of the more minor characters in the universe, such as Ray Palmer/The Atom and Jonathan Crane/The Scarecrow as opposed to the main three heavy hitters, Superman, Batman and Wonder Woman; it was nice to see the more minor characters have their time to shine, regardless of how short. It even leads to one of my favourite moments, when Scarecrow has been given the power of a yellow ring of fear, which is somehow rather funny. In terms of visuals, I have no real complaints. The style is clear, with no moments that seemed overly out of proportion or the like. The presence of the colour spectrum is well utilised, with a variety of brightly coloured superhero get-ups contrasting well with the dark greys and blacks of the zombies raised as part of the Black Lantern Corps.